When Dr. Curtis Jones took the helm of Bibb County School District (BCSD) in early 2015, his top priority became increasing academic achievement for all students. BCSD had been consistently lagging state averages for academic achievement and had a significant achievement gap between its highest- and lowest-performing schools. 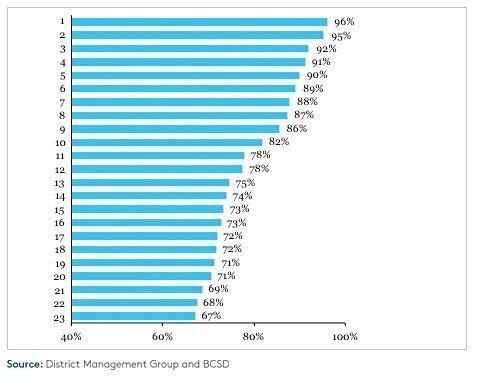 In partnership with DMGroup, BCSD began an in-depth diagnostic that confirmed and quantified vast differences in practice across the district's 22 elementary schools. Over half of the schools were teaching reading for less than the well-established best practice of 90-minutes per day, and significant variance in intervention blocks also contributed to the inequity of services. With support from DMGroup, BCSD established new instructional guidelines to help schools align with best practices and provide equitable learning and support opportunities for all students. Implementing these guidelines required overhauling master schedules for all 22 elementary schools through an iterative process facilitated by DMGroup. The new schedules came together in time for the 2016-17 school year and quickly made significant impact in every school, with 91% of teachers adhering to new guidelines and a new built-in 45-minute intervention block paving the way for educational achievement. I’m excited to see the progress taking shape. I expect our focus on scheduling at the elementary level and on reading support programs to impact our students in a positive way. Dr. Jones knew that to have a meaningful impact on raising achievement across this large district, BCSD needed to create district-wide instructional guidelines to bring all schools in line with best practices. He was specifically focused on addressing the significant achievement gap that existed between the highest- and lowest-performing schools as well as addressing equity issues by ensuring that each student had access to similar core instruction and support services. In order to implement consistent guidelines, district leaders needed a clearer understanding of how the service delivery models for core subjects and interventions worked in different schools. At the elementary level, there were 22 schools, each with its own way of doing things. Dr. Jones, along with Assistant Superintendent of Teaching and Learning Dr. Tanzy Kilcrease, began their partnership with DMGroup by seeking better insight into current practices at schools across the district. The amount of time teachers dedicated to core academic subjects varied widely from school to school. 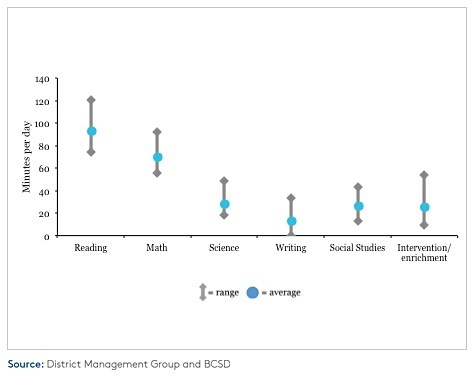 For example, in one school, students received an average of less than 80 minutes per day of reading instruction, while in another school, students received an average of more than 120 minutes per day of reading instruction – a meaningful difference over the course of a school year. Within core blocks, there was significant variation in instruction across schools and teachers. For example, best practice calls for at least 100 minutes of phonics each week for grades K-2, but time allocated for phonics varied quite a bit at BCSD schools, and little time was spent on phonics after grade 1. Students who struggle sometimes did not work with the most skilled or relevant staff or were not receiving services at appropriate times during the school day. For example, pull-out instruction was often delivered instead of, rather than in addition to, core instruction. Although schools and teachers were trying their best, the structure of the existing elementary schedules made it virtually impossible to avoid these conflicts. To provide all required supports to students, students had to be pulled out during core instruction blocks and could not easily be matched with the most relevant skilled staff. Armed with new insights from the diagnostic phase of the work, the BCSD team worked with DMGroup to create a clear set of instructional guidelines aligned with best practices and district priorities. They also agreed on which subjects should be eligible for pull-out and set a minimum number of minutes of teaching in each special subject that students should receive, regardless of which school they attended. Importantly, the team also agreed to implement a daily 45-minute intervention block, which is expected to have the most significant impact on educational achievement. Once stakeholders agreed on instructional guidelines, the next big step was to create new master schedules for all 22 schools that ensured the new guidelines could be put into practice. DMGroup worked directly with school principals and their teams to create master schedules. The process was collaborative and iterative as school leaders discussed alternatives and trade-offs of the various master schedules under consideration. The process was further streamlined by using DMGroup’s Elementary Scheduling software, which built in district instructional guidelines as defaults and enabled teams to easily make adjustments while staying within guidelines. What had formerly seemed impossible could now become a reality with the optimized master schedules. Diagnostic analysis gave district leaders the information they needed to understand the teaching practices across classrooms and schools—a critical baseline for moving forward. Clear and consistent instructional guidelines include increased time for core reading and math instruction to align with best practices for achievement, and clear limits on pull-out support during these blocks. Instructional guidelines and associated PD for teachers are having an impact, as walk-throughs indicate 91% of teachers are observed to be on schedule. Along with instructional guidelines, schools have adjusted schedules and teaching practices to ensure all students receive the same education and have the same access to services across the district. A significant change in the master schedules for all schools was the addition of a new 45-minute intervention block, which makes it possible to ensure that extra help for students is in addition to core instruction, and not instead of core instruction. Today, master schedules ensure students who struggle get extra help that maximizes learning time in core subjects. Before, every school was on its own to create its master schedule resulting in a variety of approaches and formats that made it difficult for district leaders to provide input. 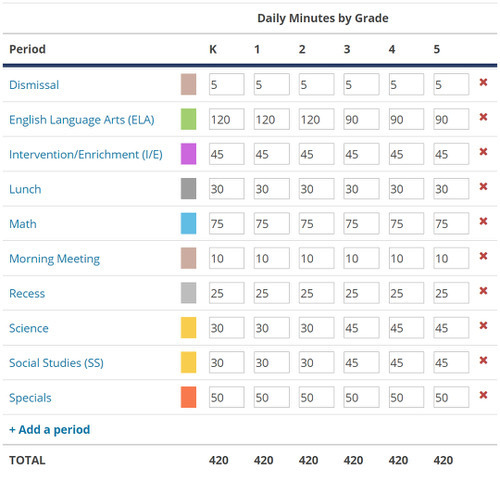 Today, DMGroup scheduling software allows central office to set parameters and review consistently-designed schedules while giving principals and school leaders flexibility to refine master schedules that meet their needs. When Dr. Curtis Jones took the helm of Bibb County School District in early 2015, his top priority became increasing academic achievement for all students. This case study explores how developing instructional guidelines and implementing effective scheduling across all 22 elementary schools have paved the way to raising achievement and addressing equity at Bibb County School District (GA).